Dimensions 0.50 by 7.50 by 9.25 in. Criminal justice, Administration of; Japan. Criminal justice, Administration of; Cross-cultural studies. Designed to effectively explain the complexities of justice systems around the world, COMPARATIVE CRIMINAL JUSTICE SYSTEMS: A TOPICAL APPROACH, 6/e makes the comparative approach far more understandable and accessible, helping students recognize the growing importance of an international perspective. It organizes key concepts in a sequence that many students will already find familiar, progressing from issues of law to the agencies of police, courts, and corrections. Students will gain a realistic understanding of the many ways policing, adjudication, and corrections systems can be organized and operated. Unlike most competitive books, it contains coverage of more than 30 countries, offering insights into everything from Islamic legal tradition to recent criminal justice reforms in Japan. This editionÃ¢ÂÂs improvements include new coverage of the Eastern Asia legal tradition (e.g., China and Japan); Learning Objectives utilizing BloomÃ¢ÂÂs taxonomy phrasing; and more visually appealing images throughout. 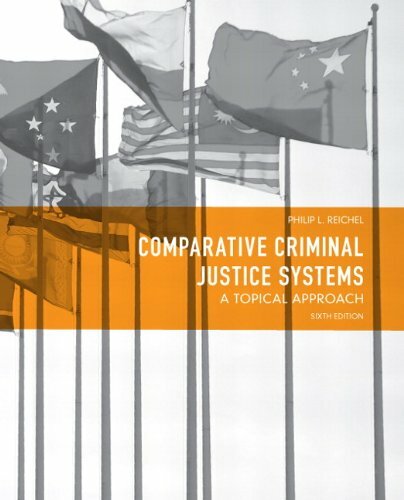 About: Designed to effectively explain the complexities of justice systems around the world, COMPARATIVE CRIMINAL JUSTICE SYSTEMS: A TOPICAL APPROACH, 6/e makes the comparative approach far more understandable and accessible, helping students recognize the growing importance of an international perspective. About: For courses in Comparative Criminal Justice Systems, Comparative Criminology, and Comparative Government. About: For junior/senior-level courses in Comparative (or International) Criminal Justice Systems, Comparative Criminology, and Comparative Government. About: Discussing how various countries around the world have organized their police, courts, and corrections agencies, this insightful text provides the rationale for studying cross-national issues in criminal justice by giving students a knowledge base for understanding and appreciating the different ways justice is conceived and achieved around the world.